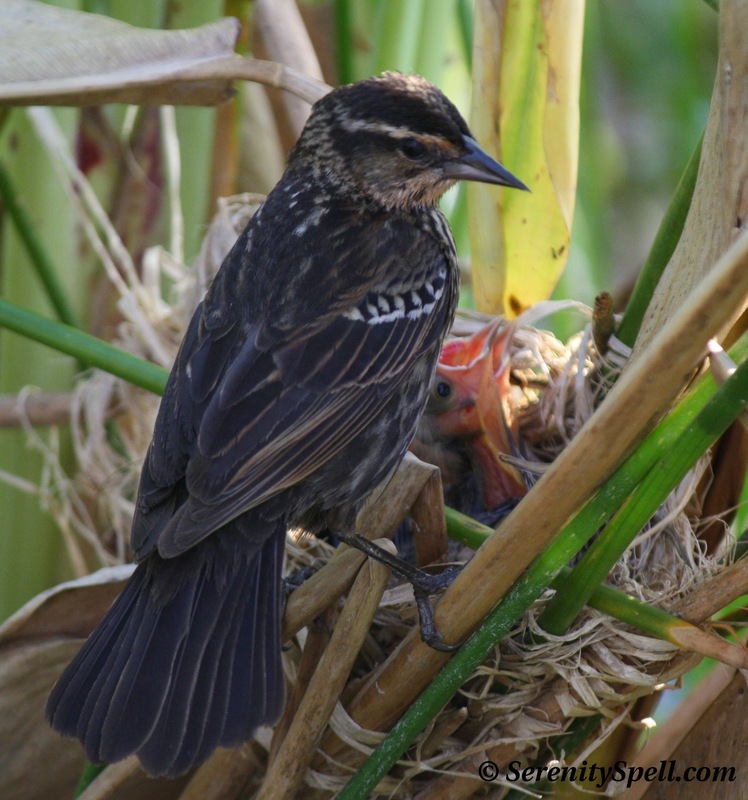 Red-winged Blackbirds… And Their Babies! Another nearby nest, with hatchlings! Since Red-winged Blackbirds nest in loose colonies, there’s no dearth of nesting activity, if one’s looking closely enough in our dense marshes. This clutch consisted of three eggs — typical for the species. The eggs were incubated by the female alone, and hatched within 11 to 12 days. 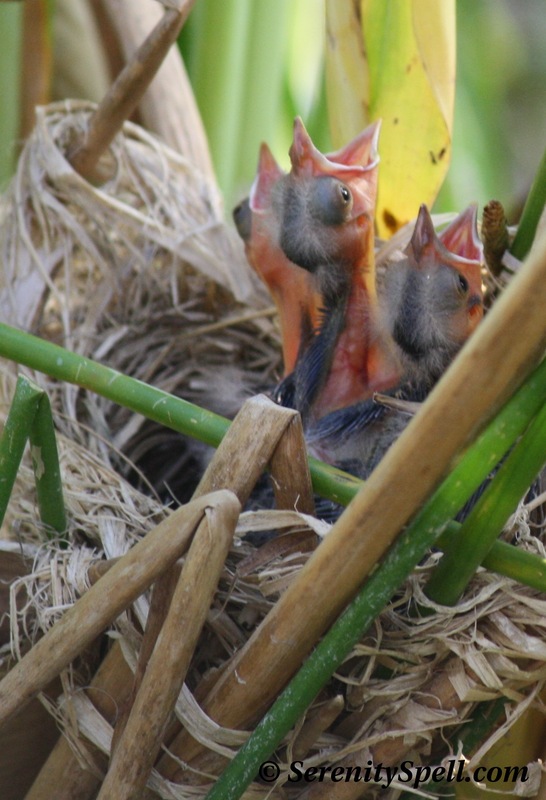 Red-winged Blackbirds are born blind and naked, but will be ready to leave the nest 11 to 14 days after hatching. 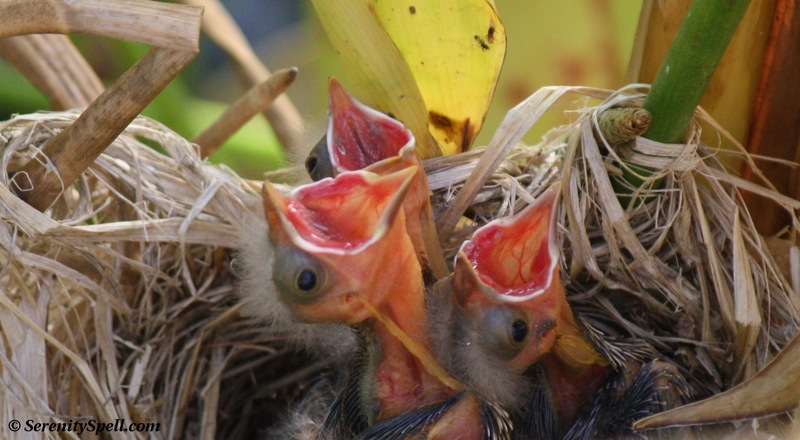 Every time the wind rustled the leaves of this nest, the hatchlings were up and chirping for food…. I like knowing what the female red-winged blackbird looks like. 🙂 I’ve seen the males a-plenty. well, I’ve probably seen the females a lot too, but didn’t realize. Enjoying your blog and pics! Interesting ! Great captures ! So cute the baby birds!! “FEED ME, FEED ME!” Great shots. Thanks so very much! I love those babies — I always try to snap them while the parents are off and about looking for grub, so as to not disturb them. Wish they were a bit clearer, but they were further in the marsh. I love these pictures! If you don’t mind me asking — what size lense do you use? What amazing and tender shots! Hello! Can’t remember how I found my way here, but I love your site! The little ones are just perfect..so amazing! Heh! You sound like me. 🙂 Well, I’m happy you found your way!! Thanks so very much — aren’t the babies just amazing? The other evening I saw even tinier hatchlings, but was unable to get a good shot… The parents were becoming manic with my presence, as they were trying to feed. I didn’t want to cause any undo upset. Thanks for a great blog. I gave you a Bean’s Pat on my blog today, which is about egrets. Great photos. I had two black-cap chickadee nestlings fledge from the yard box yesterday. After spying six eggs originally, and finding out that they are in decline in recent years, I felt proud to have hosted the pair and have two survive to fly. Now I have a bluebird nesting in the other yard box with four eggs at last count. Busy around here! Thanks for letting me camp out in your blog today. I had a great time and tried to leave my campsite as clean as when I arrived. Guys There are some of those near my pond in healthy reeds and the mother does not hate me for coming near her nest she just flies around until i go away but they are the last nest alive the rest of the nest have dead eggs or shriveled remain ts of babes and one has hatched but the eggs are white with brown speckles so they are a mixed up group still they are beautiful please tell me when you have found out whats going on. Hmmmm…. I’m not sure if they’re red-winged blackbird eggs, by the sounds of it! Perhaps some were left by another bird? Unincubated? guys i found a nest with a egg but it was a pooped in nest and the rest of the eggs were gone no birds go in that nest so i held that egg and i feel life in it please help me. I’m warming it with a reptile lamp but not too close a nice warm air and a fake nest but i need to make sure if you guys can help me take care of it. it has a dent on the egg like the chick was about to get out early but it decided to rest a while longer i can even see a bit of the inside but the chick ha not hatched reply please!! Wow, you’re so good for caring for it!! It sounds as though momma left the nest. 😦 Scared off by predators or people, perhaps. Do you have a wildlife care center you can call? We have an SPCA Wildlife Care place down here, for instance…. oh an by the way the second chick hatched but the third one was rotten so i geuss the male or female went and disposed of it. Well today the chicks were gone but a pink bag was near the nest and no feathers where in the nest even though the babies don’t have loose feathers but they are too big to be moved by the mother and they are only big enough to hop but i really think somebody could have stole them. i don’t have a clue. oh and no i don’t think we have a center that would really care for them either. I’m so sorry…. I know people in your situation who have done their best to rescue them, themselves, because they’ve had no other resources. I wonder what was happening, here…?? the egg was rotten but the day i took him inside was the last day he lived because the egg had dents in it and now it’s gone i felt a beating heart but now it’s lost I wanna cry but I can’t or the computer will short out. people are so cruel sometimes i just wish it would end. I wish the death and evil would leave. I love animals and some people treat them like a punching bag. I was on youtube bored and i clicked on a video about a kitten named ugly it made me cry 2 times!! why ugly why!! It reminds me of careless people and what they do to birds and animals. Oh they weren’t horrifice it was just a sad story The birds are gone and sombody might have taken them they were too big for moving but they couldn’t have jumped out but they had eyes opened. Well, I hope they’re OK — you’re right, somebody definitely may have rescued them!! Well The thing is i just found a dead bird in the pond…. * tears go down eyes* there was a struggle. AH! Well, at least it was all the doings of the NATURAL world! We have MANY water snakes here, too… And while I know MOST aren’t poisonous, there’s always the water moccasin, heh! It bit me it turns out it was some random snake……. but i found out it wasn’t a water snake either…. cause it’s dead now XD I’m relieved that i did that. Even if it kills another animal i try to do my best on saving baby animals. Kinda like warriors when the cats pare fighting to survive. i love that book so emotional. Love those little hungry beaks – Fun photos! Hee, I loved spying these guys, throughout the process from nest-building to them leaving it! You have a good rapport with nature and the birds trust you and your lens. I enjoy viewing your photos. You have no idea how I’ve tried to get photos of the red-winged blackbirds. Maybe someday. We have a scrub jay in my neighborhood and I’ve set the intention of photographing that tricky bird this summer. It’s out of region and hangs out with the stellar jays. I hope you get to snap a few of these wonderful guys, too! LOVE the scrub jays. Can’t wait to see your captures! What do you feed the babies?? You may wish to check with a wildlife rehabilitator on that — I’ve only seen them in the wild, and haven’t done rescue on these guys. Rescuing babies is always quite tricky (and often people mistake healthy bird babies as abandoned, when in actuality they’re not).